Here we are in prom season again, and there's a delicious scent in the air. But this time it's not fragrant flowers. It's fried chicken. Enter KFC, which is encouraging prom-goers to adorn their wrists with fried chicken before heading to the big dance and twerking all up on each other, which I assume is what the kids are doing these days. You can actually order one for $20 (sorry, limit of 100). You get a lovely corsage for your date and a $5 gift card to go and buy the chicken yourself. "Chicken not included (duh). 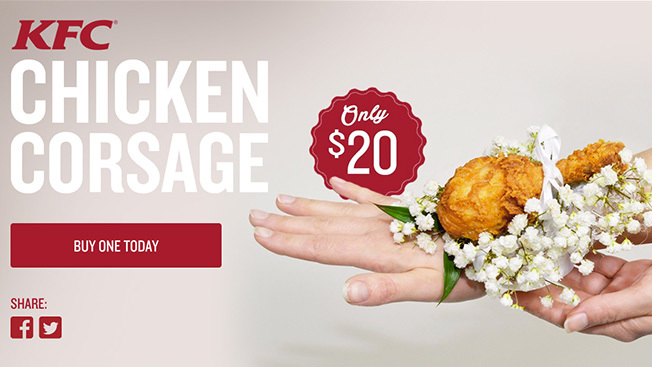 Each corsage kit includes a $5 KFC gift check, so you can customize your corsage with Original Recipe, Extra Crispy or Kentucky Grilled Chicken. Whichever best matches her dress. Local corsages will have fresh baby's breath and out-of-town corsages will have silk baby's breath." Take a look below at what will probably happen if you get this delicious bit of fast-food swag.